"Yeah," as his recent hit proudly declares, it's true: American country star Joe Nichols headlines the main stage at The Last Great Colosseum while award-winning platinum artist Lee Greenwood brings an authentic patriotic flair to America's Night Race, the Bass Pro Shops NRA Night Race on Saturday, Aug. 18. Nichols, who has earned six No. 1 country singles, will take the stage at the official Bass Pro Shops NRA Night Race pre-race concert, just prior to BMS' popular driver introductions on Saturday. Greenwood, whose hit, "God Bless the USA," has become an American institution like apple pie and Chevrolet, returns to Bristol to kick off America's Night Race, which is celebrating its 40th running under the lights. "We are thrilled to welcome Joe Nichols to our main stage at The Last Great Colosseum, continuing our tradition of showcasing some great musical acts during the Bass Pro Shops NRA Night Race," said Jerry Caldwell, executive vice president and general manager of Bristol Motor Speedway. "It's also gratifying to have our good friend Lee Greenwood return to sing his classic 'God Bless the USA.' No one can energize a crowd like Lee and put them in a red, white and blue mood." Nichols, one of country music's most praised traditional country artists, has built his brand off chart-topping hits like "Brokenheartsville," "Tequila Makes Her Clothes Fall Off" and "Gimme That Girl." The hitmaker, who holds multiple RIAA platinum and gold certifications, doesn't seem to be slowing down either: his latest single "Billy Graham's Bible" took the country charts by storm earlier this year. Nichols has even covered hits from other genres, including Sir Mix-A-Lot's "Baby Got Back" in late 2017. "I'm ready to get the party started for the Bass Pro Shops NRA Night Race," said Nichols. "NASCAR fans know how to have a great time and I can't wait to put on an awesome show for them at The Last Great Colosseum." 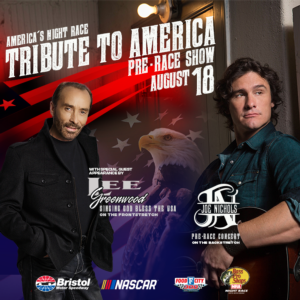 Greenwood, who last visited Bristol Motor Speedway for the 2016 Pilot Flying J Battle at Bristol, returns to showcase the American spirit by performing "God Bless the USA," an award-winning song he wrote in the back of his tour bus in 1983. Combined with the ever-popular National Anthem performance by the children of the Motor Racing Outreach, they will offer a true patriotic testament to America's Night Race, which has seen some of the most legendary moments in NASCAR history for the past 40 years under the lights. "I've sang at the Bristol track at least six times," said Greenwood. "It's the only one of its kind and it's always exciting. I'm looking forward to singing at the race and honoring America." While supplies last, Bass Pro Shops NRA Night Race ticket holders may add on a Pre-Race SuperPass and be stage-side (on the track) for the concert featuring Joe Nichols. The SuperPass also includes a Track Walk and track access for driver introductions.